As mentioned in the preceding Chapter, the first person to settle in the bush that covered the present site of Port Elgin village was Lachlan ("Loch Buie") McLean. The summer of 1849 had seen him engaged at the Pishing Islands. After the work of the season there was over, he found his way to Port Elgin Bay. The supply of provisions he had was small; nevertheless he made up his mind to settle there for the winter at least. On land lying just north of Market Street he built a shanty, in which he kept a tavern for several years. His patrons consisted principally of the settlers in Saugeen, Bruce and Elderslie, and of land-seekers going into these townships. The amount of travel past "Loch Buie's" was by no means inconsiderable before the erection of Burgess' (now McCalder's) bridge, as the route taken by travellers going to the townships above named from Southampton was along the lake shore as far as the bay at Port Elgin; there it struck inland. At "Loch Buie's" the heavy loads of flour or other supplies the settler had carried on his back thus far were set down, and rest and refreshments were sought. George Butchart, one of the very earliest of the pioneers of Bruce, came to the county with the idea of engaging in lumbering operations on the Saugeen. Perceiving how much more easily a dam could be erected across Mill Creek than the wide Saugeen River, not to mention the difference in cost, he in the spring of 1852 commenced the erection of a dam and saw-mill on Mill Creek, at a point now within the village limits. This mill he operated for a couple of years, to the great convenience of immediate settlers, until 1854, when he sold the water privilege and sawmill to Benjamin Shantz and moved to Baie de Dore. Mr. Shantz, on becoming possessed of the property, commenced the erection of a grist mill, which was completed in 1855. "I was the first store-keeper in the township of Saugeen, having opened a store in what is now the village of Port Elgin on May 27th, 1854. At that time the village contained only three houses, a tavern unfinished log-house that I bought for a store, that had been built by a Mr. Butchart, who had sold out to Benjamin Shantz before I went to Saugeen. I bought the house and 1-4 acre of land on the corner from Benjamin Shantz. After opening my store the people got me to petition the Post Office Department to establish a post-office. The petition was granted, and I was appointed postmaster. The post-office was named Normanton [This office at first was known as "Normanton," a name it bore until April 1st, 1874, when the post-office authorities consented to change it to Port Elgin. A. H. R. Kennedy continued to act as postmaster for about a year, when he was succeeded by John J. Lehnen, who held the position until 1864. Archibald Boy was the next postmaster. On his death, in 1868, his widow was appointed his successor in office, which position Mrs. Boy has retained until the present day.] on account of it, at that time, being considered one of the most northern post-offices in Canada. The nearest date I can find as to when the Normanton P.O. commenced business is about the 16th December, 1854. At that time there was no waggon road through Port Elgin; the mails were brought on foot by a man of the name of John Urquhart, who once a week carried the mail from Kincardine to Southampton." After conducting the business above-mentioned until April, 1855, Mr. Kennedy disposed of it to Messrs. Lehnen & Ruby. [J. J. Lehnen only remained in the firm for a few years, after which he sold his interest to H. Hilker, when the name of the firm became Ruby & Hilker. On Mr. Ruby's death (August 9th, 1892) the business was continued under the present name of Hilker & Co., by Henry E. Hilker. It is satisfactory to think that the first mercantile business started in the village is, after half a century, still flourishing. The next merchants to commence business in Port Elgin were George Craig and Edward Gordon.] Mechanics and others also in increasing numbers were led at an early date to settle at Port Elgin. By united effort they had the satisfaction of witnessing the surrounding walls of forest trees being pushed further back, roads opened, houses built, and trade and commerce increase. These last-mentioned features received a marked impetus by the construction of a pier, built in 1857-58, by private enterprise, which permitted the landing of passengers and goods. Prior to this, when the steamboat entered the bay on its way to and from Goderich a large scow (built by George Fenwick) was rowed out until it lay alongside the steamer. By it all passengers and freight found their way to land. The pier helped to a great extent to build up the export trade of the village. Grain buyers appeared in the persons of Martin Hoover and Samuel Bricker, who built, at the harbor, grain storehouses. About the time the pier was built the government undertook the construction of a small breakwater, the initial step toward the making of a harbor. Among the early settlers of Port Elgin alive to-day and a resident of the village, is J. C. Kennedy. September, 1855, is the date when he first set foot there. After he had succeeded in erecting a house and shop he commenced business at his trade as a wagonmaker, which he carried on successfully during many years until he retired. In May, 1856, James Muir, another of the pioneer artisans of Port Elgin, took up his abode in the village, and since then has been one of its active citizens. Andrew Hood was Port Elgin's first blacksmith, but unfortunately he met an untimely end. He, with his family and brother, had been enjoying a sail on the lake, Returning therefrom, and after having entered the bay, by some mishap the boat capsized and all were drowned. Of industries that developed about the time referred to there might be mentioned the steam sawmill built in 1856 by Samuel Bricker. The boiler for this was floated down the Saugeen. To successfully navigate such an unwieldy craft pieces of timber were secured to its sides at the water line, forming a rough sort of a deck on which to stand. They also served as outriggers to prevent the boiler from rolling over. [The incident, clipped from the Paisley Advocate, given in a footnote in Chapter V., about floating a boiler down the Saugeen, doubtless referred to this exploit, although the Advocate fixes it earlier and says that the boiler was for a mill at Southampton.] A foundry was commenced in a small way by Alex. McLauchlan in 1859. The extent of the plant can be judged from the fact that horse-power was used to drive the air-blast required when smelting. A few years later, when his brother Robert became a partner in the business, a ten horse-power engine was installed. Brick-making was started by Barthold Smith in 1860. A woollen mill was another industry of the village, inaugurated in the early sixties by Messrs. Buschlin & Eby. They who subsequently carried on this industry have been Betzner & Sons, McCarthay & Wilson, Lewis McCarthy and M. G. Barber. During the half dozen years or so subsequent to the last-mentioned date the growth of the village was not rapid. This is shown by a comparison of the amount of assessments. In 1868 the assessed value of village property was $31,120. Five years later, in 1873, it was but $92,000. The following disconnected incidents belong to this period. Port Elgin, with other lake ports, came in for its share of harbor grants from the county, which spent in 1867-68 some $3,600 on works in the harbor. [Port Elgin Harbor Works in 1867 and 1868 are described as consisting of a landing pier extending 264 feet out into the lake and of a breakwater 509 feet in length.] Some time about the year 1869 Port Elgin was first connected with the outer world by electric telegraph. In the same year [See By-law No. 36 of County of Bruce, passed December 9th, 1869.] a sectional tax was levied by the township of Saugeen on the property in the village. "To raise the sum of $350 to defray the expense of fencing ground and erecting a suitable building within the limits of the village for agricultural and other exhibitions." Not much could be done with this small amount, yet from such humble beginnings has sprung the highly successful North Bruce Biding Exhibition of to-day. Another event of this period in the history of Port Elgin was the establishing in 1869 of a local newspaper, The Free Press. The enterprising publisher was H. J. Benner. For seventeen years this paper experienced the usual vicissitudes of country journalism, till, in 1886, it and The Busy Times were merged into one under the name of The Port Elgin Times, now The Times. The Busy Times made its first appearance in the last week of December, 1877. W. S. Johnston (now of Toronto) was the proprietor and editor. In 1888 Robert Munro purchased The Times, and has conducted it ever since most successfully. The opening of the railway for traffic in 1873 resulted in bringing to Port Elgin an augmented volume of trade. The population increased and attained to a number that authorized an effort being made to have the village incorporated. On a census being taken that year, the population was found to be 941. The County Council thereupon passed, on June 7th, 1873, a by-law incorporating the village of Port Elgin, also directed that the first municipal election "be held in the old school-house on the south side of Mill Street," and that John Eastwood be the returning officer. The election, which was held the following January, resulted in the return of H. Hilker as reeve, [The following are the names of those who have been reeves of the village of Port Elgin, with the years in which they held office, viz. : H Hilker, 1874, '75, '77, '78, '79, '80, '82 ; A. C. Sinclair, M.D., 1876; D. J. Izzard, 1881, 1891; W. S. Johnston, 1883 to 1890; E. Munro, 1892, '93; J. A. Chapman, 1894, '95, '96; J. R. Paterson, M.D., 1897; H. E. Hilker 1898, '99; John George, 1900; D. Geddes, 1901 to 1906.] and D. O. Bricker, James Muir, Martin Hoover and John Mcintosh as councillors. Following the separation from the township of Saugeen an adjustment of assets and liabilities of the two municipalities had to be arranged. In this matter Henry Hilker and James Muir acted for the village, and Neil Cassidy and John Peirson for the township. The decision arrived at was that the village assume, as its share of the liabilities of the township, the sum of $535.30. The decade following the opening of the railway may properly be looked upon as the most prosperous period in the first half century of Port Elgin. Not only did it become incorporated, but business was conducted on a scale larger than previously known. Farmers found it to be a satisfactory market at which to sell their various descriptions of produce, while its reputation as a grain market was widespread. The most prominent and energetic of Port Elgin's business men of this period was D. O. Bricker, [Dilman Oberholt Bricker was born, in the year 1840, in the county of Waterloo, of Pennsylvania Dutch parents of the Mennonite faith. 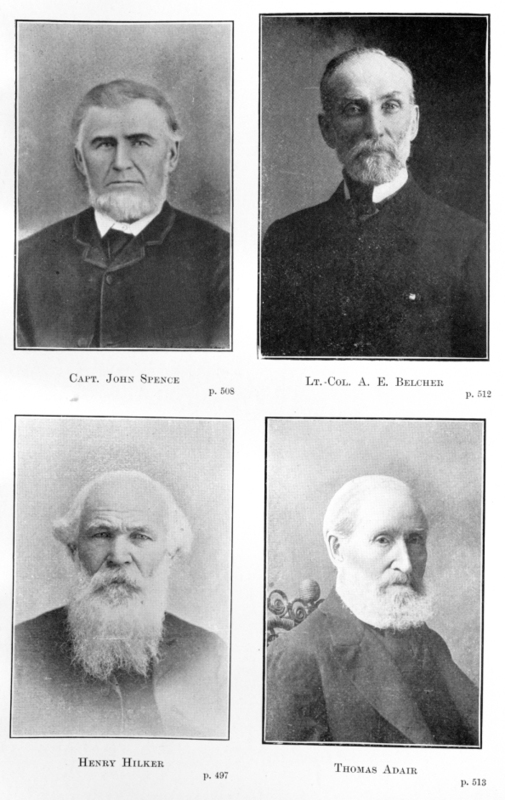 His father, Samuel Bricker, with his family, settled in Port Elgin in March, 1854. D. O. Bricker was at an early age engaged in business for himself. His energy and enterprise not only brought him to the front, but the village also. For years he conducted his varied business enterprises successfully. To carry these on conveniently he built the Arlington Block, which provided the largest premises occupied by any firm in the county. Suffering heavy losses in grain, Mr. Bricker, in the fall of 1880, became bankrupt. To retrieve his fortunes Mr. Bricker went to Winnipeg and was again successful. After twenty years there his health gave way and he returned to Port Elgin, where he spent the last two years of his life. His death occurred April 17th, 1904.] although others there were deserving of mention who also developed large commercial and industrial enterprises, such as Zinkan, Cress & Co. Their tannery, manufacturing for the shipping trade, employed a large number of workmen, and was one of the leading industries of the village. The promise the village gave of further growth induced the Bank of Hamilton to open a branch there in 1873. For thirty-three years this was the sole chartered bank in Port Elgin, although a private bank (Allen, McMahon & Co., afterwards H. A. Allen) carried on business for about fifteen years of this period, until it closed its doors in 1894. In the summer of 1906 the Metropolitan Bank opened an agency in the village, supplying it with abundant banking facilities and incidentally showing the increased business importance of Port Elgin. After the incorporation of the village, the need was felt of a suitable town hall. The matter was taken up in 1875 by the Village Council, which at one of its first meetings passed a by-law to raise a loan of $3,000 for this purpose. The site, at a cost of $900, was purchased from Edward Gordon, and the contract was let to J. McLachlan for $2,460, and in August following the corner-stone of the building was laid. The sum raised as above mentioned, being insufficient to complete the building, more money had to be raised. To do this, in 1877 the Legislative Assembly was applied to, which, in response to a petition, passed an Act [40 Vic. Chap 36.] authorizing the sale by the corporation of certain public squares and reserves on the following mentioned conditions: "The proceeds of every such sale by the said corporation . . . shall be held and applied by it, in fully finishing and completing the town hall . . . and in aiding the Board of School Trustees ... in purchasing a site and erecting such school buildings as the said Board may require to have built." The new town hall was opened March 7th, 1877, with a concert and a ball. The harbor at Port Elgin, like all others on the eastern shores of Lake Huron, has cost a large sum. The initial work, as before stated, was commenced in 1857-58. In 1872 Alex. Sproat, the member for North Bruce, stated in the House of Commons that the expenditure up to then on this harbor was in excess of $30,000, of which but a small proportion had been paid by the government. The departmental report for the year ending June 30th, 1899, states that the expenditure by it up to then amounted to $80,652. Since then further large sums have been expended, so that it is safe to say that the cost of making the harbor what it is to-day is greatly in excess of $100,000. Mariners may say that its entrance is none too easy under certain conditions of wind and weather, but, once in, vessels have all the protection needed. Port Elgin harbor is an excellent one for a vessel to winter in, there being no danger from spring freshets, as is the case where the harbor is placed at the mouth of a river. Prior to the vote being taken, in June, 1906, on the last two mentioned items, the then debenture debt of the village was stated to be $34,005.49, exclusive of local improvement debentures. It will be noted what a large amount has been voted by the ratepayers in the endeavor to build the village up as a manufacturing centre. Success has unfortunately not attended all these efforts. At present the leading industry of Port Elgin is probably the brush factory. This was established in 1883 by John Hepner (previously a resident of Napanee) and six business men of the village. Two years later, in February, 1885, the works were destroyed by fire. A stock company was then formed under the name of the Port Elgin Brush Co., Limited, and the works rebuilt. T. I. Thompson was president of this company, and B. B. Boyd manager. Ten years later the company went into liquidation. In June, 1896, the plant was purchased by H. H. Stevens, John Hepner and E. H. Schiedel, who carried on the business under the name of Stevens, Hepner & Co. In 1901 the last-mentioned gentleman retired from the firm. In that same year new buildings were erected and the capacity of the plant doubled. Five years later, in the spring of 1906, the firm made a proposition to the village, offering to erect an addition to their factory of 180x36 feet, of three stories and basement, and to double their capacity for production, provided the village would install a system of waterworks (affording fire protection), and guarantee a loan of $10,000 for ten years. The proposition was accepted by the village, and the required by-law was passed by a large majority. The business is at present carried on under the name of The Stevens, Hepner Co., Limited. A bonus and loan totalling $10,000 was granted to the Dominion Harness Company, in 1903. This company has not, as originally started, been a successful venture. In 1906 the company was reorganized under the name of the Dominion Pressed Steel Company, to manufacture shovels and similar goods. John George is the president of this company, and F. Miehle is the manager. High hopes are held that this firm may prove a success and the village derive benefit from the assistance rendered. The first school building of the village stood on the site of the present High School. A Miss Agnes Lawrence was the first teacher. Her father, Alexander Lawrence, was the next who endeavored to lead the youth of the village in the paths of learning. The school buildings and furnishings at first were none too elaborate. These conditions improved, however, as the years rolled by. In 1875 a good brick school-house was erected, and in 1890 a further advance was made when the present handsome school premises became the home of the village Public School. The High School was opened in the fall of 1889. For the first fifteen years J. T. Lillie, B.A., filled the position of headmaster, and did so in a manner that brought credit both to the school and to himself. On his resigning, Mr. J. Campbell Clark was appointed his successor. In addition to the schools belonging to the regular educational system of the province, there existed an Academy, connected with the United Brethren Church, during the years 1880, 1881 and 1882, the principals of which were the Rev. A. B. Sherk and D. B. Sherk. Public religious services were in the very early days held in a building erected for the common use of all denominations. The Presbyterians were the first to be organized into a congregation. The following extract from the Annual Report for 1894 of this congregation is so complete that it is worthy of permanent preservation, and a large extract therefrom is here given: "While yet the settlers were few in number and were separated from one another by the primitive forest, the Presbytery of London, realizing that many of them belonged to Presbyterian families, sent in one and another of their ministers to let the people feel that the church had not lost sight of them, and was interested in their welfare. Among the first to come (in 1854) was the Rev. John Scott, then of St. Andrew's, London (afterwards Rev. Dr. Scott, of North Bruce), who, having come early in his ministerial life to preach and dispense ordinances, and by the way to gather together the scattered few and lay the foundations of Presbyterianism in the district, spent the last ten years of his ministry among some of the very people for whom he had many years before done something to supply with the means of grace, and keep them in connection with the church of their fathers. The reverend doctor tells how that in the early fifties he more than once or twice, by appointment of Presbytery, visited this northern country and preached at Southampton, Port Elgin, Dunblane, Paisley and North Bruce. One of the first services held within the bounds of what afterwards became the Port Elgin congregation was conducted by him in the house of Mr. John Smith, on the 6th concession of Saugeen. In those days so dense was the bush that the minister failed to find Mr. Peter Smith's, although it was only about a mile and a half from his brothers at the riverside!, on what is now the McGillivray farm. The Rev. W. Ball, then of Woodstock, visited the district in 1854, and dispensed ordinances at various places. The first ordained minister was the Rev. James H. McNaughton, who was settled over the congregation of Southampton from 1855 to 1859, and who had a number of preaching stations, Port Elgin among the rest, which were supplied more or less regularly by him for several years, without their being united to form a pastoral charge. About the time of Mr. McNaughton's resignation Mr. Alexander Eraser was appointed as missionary at Port Elgin, where he labored with so much acceptance that he was called as pastor, and ordained and inducted on the 22nd of October, 1861. In July, 1862, we find a communion roll of 53 members; but as eleven of these had been added since Mr. Eraser's settlement, the membership at that time must have been about 42. The first church, which was built in 1860, was soon found to be so inconveniently situated (the village having grown in a different direction from that which was originally expected) that it was never fully completed; and in 1870, although the membership was not by any means large or wealthy, yet, animated with commendable zeal, and realizing that a conveniently situated church was necessary to the advancement, if not of the very existence, of Presbyterianism here, the erection of the present church building was determined upon and a substantial and comfortable brick church with basement' was erected. Early in 1871 the basement was opened for worship. The church had not been erected much more than a year, when the Rev. Mr. Fraser, who had faithfully and amid not a few hardships ministered to the people for about eleven years, tendered his resignation, which was accepted early in 1872. After a vacancy of about eighteen months, during which a union had been consummated with Dunblane, the Rev. D. C. McKay, M.A., was called and settled as pastor of the united charge. Scarcely had he entered upon his ministry when he was stricken down, and died on September 21st, 1873, after a short pastorate of only five weeks. Eighteen months again elapsed before the settlement of the Rev. James Gourlay, M.A., was effected. Meanwhile the church building had been completed and finished at a cost of about $4,000, besides a further expenditure for the bell, and was opened on September 27th, 1874, by Rev. A. Topp, D.D., of Knox Church, Toronto." This building was enlarged in 1889 at a cost of $1,300, and extensively renovated in 1901. The pastorate of the Rev. Mr. Gourlay, which extended over twenty years, was. terminated by his resignation in July, 1895. The Rev. A. H. Drumm was the next to minister to the spiritual needs of the congregation. He was followed by the Rev. A. Mahaffy, who was inducted in January, 1900, to this charge, which he continues to minister to. The congregation held jubilee services on July 9th, 1905. Other denominations were not long in following the example set by the Presbyterians, and proceeded to organize as congregations, the United Brethren being the next to do so. In 1866 there were five churches in the village, the three others not above mentioned being the Methodist, the Mennonites and the Church of the New Jerusalem. In a few years the congregation last mentioned ceased to be, but the number of denominations in the place remained the same, as the Baptists formed themselves into a congregation. Subsequently, some time in the seventies, congregations belonging to the Church of England and the German Evangelical Church were formed. The above-mentioned number of religious denominations in this locality has of late years been increased by a congregation of Latter Day Sainte (Mormons), whose church is just beyond the southerly boundary of the village. The attractions that Port Elgin offers as a summer resort are yearly becoming more and more appreciated. The splendid beach, the bracing breezes that blow from off Lake Huron, and the mineral spring and baths are attracting each season an increased number of visitors. The efforts put forth by the people of Port Elgin to hold annual gatherings of the pioneers of the county are worthy of the fullest commendation. The first of these was held July, 1899, and is referred to in Chapter VIII. Since then these gatherings have been held annually, and are one of the events of the summer at Port Elgin. At the time of writing the village is possessed, as not before for years, with a sense of its possibilities. That it may have the courage' to press on and attain is certainly the desire of its well-wishers.